Part I. The Nature of Risk in the Electric Sector 1. A Perspective on Regulatory Risk in the Electric Industry (W. Riggins). 2. Electricity Risk Management for the Beginner: What It Is, Why It Matters and How to Deal With It (A. Hyman, L. Hyman). 3. Surprised by Choice: The Implications of Technology for Strategic Risk (M. Chesser, D. Bodde). 4. Why the Transmission Network as Presently Planned Will Not Provide the Efficient, Economic and Reliable Service that the Public Wants (L. Hyman). Part II. Current Approaches to Managing Risk: Their Power and Limitations 5. The DCF Approach to Capital Budgeting Decision-Making (D. Lander, K. Leggio). 6. Real Options and Monte Carlo Simulation Versus Traditional DCF Valuation in Layman’s Terms (J. Mun). 7. Enterprise Risk Management in 2005 Moving Beyond Market and Credit Risk (J. Utter). Part III Emerging Risk Management Techniques 8. Overview of Operational Risk Management at Financial Institutions (L. Barriga, E. Rosengren). 9. The Application of Banking Models to the Electric Power Industry: Understanding Business Risk in Today’s Environment (K. Leggio et al.). 10. What Risk Managers Can Learn From Investors Who Already Know and Consider the Risks and Who Wish That Professional Risk Managers and Decision-Making Executives Would Coordinate Their Efforts and Figure Out How Risk Taking and Risk Management Efforts Can Mesh (L. Hyman). Executive Decision-Making under KUU Conditions: Lessons from Scenario Planning, Enterprise Risk Management, Real Options Analysis, Scenario Building, and Scenario Analysis (M. Taylor et al.). Assessing Capital Adequacy (R. Anderson and the Committee of Chief Risk Officers). Full-Spectrum Portfolio and Diversity Analysis of Energy Technologies (Shimon Awerbuch et al.). The increasing complexity of emerging business models and a growing societal concern with the integrity of financial reporting now leads to new emphases on accountability within large, publicly traded energy corporations. 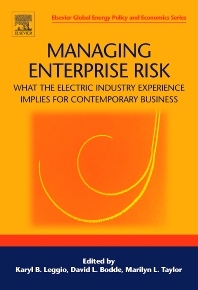 Managing Enterprise Risk: What the Electric Industry Experience Implies for Contemporary Business emphasizes the implications these issues have in the electric industry, a traditional infrastructure that underlies the digital society and now faces extraordinary environmental, regulatory, and technological uncertainties. Energy consultants, policy-makers, decision-makers, economists, energy researchers.